← Can Premium MOOCs Find an Audience? And that’s just from this postseason! No one likes flopping, but it is not going away anytime soon. This post explains the rationality of flopping. The logic is as you might think–players flop to dupe officials into mistakenly calling fouls. There is a surprising result, however. When flopping optimally, “good” officiating becomes impossible–referees are completely helpless in deciding whether to call a foul. Worse for the integrity of the game, a flopper’s actions force referees to occasionally ignore legitimate fouls. This being a blog post, let’s construct a simple model of flopping. (See figure below.) The game begins with an opponent barreling into a defender. Nature sends a noisy signal to the official whether contact was foul worthy or not. If it is truly a foul, the defender falls to the ground without a strategic decision. If it is not a foul, the player must decide whether to flop or not. The referee makes two observations. First, he receives the noisy signal. With probability p, he believes it was a hard foul; with probability 1-p, it was not. He also observes whether the defender fell to the ground. Since the defender cannot keep standing if the offensive player commits a hard foul, the referee knows with certainty that the play was clean if the defender remains standing. However, if the player falls, the referee must make an inference whether the play was a foul. Payoffs are as follows. The referee only cares about making the right call; he receives 1 if he is correct and -1 if he is incorrect. 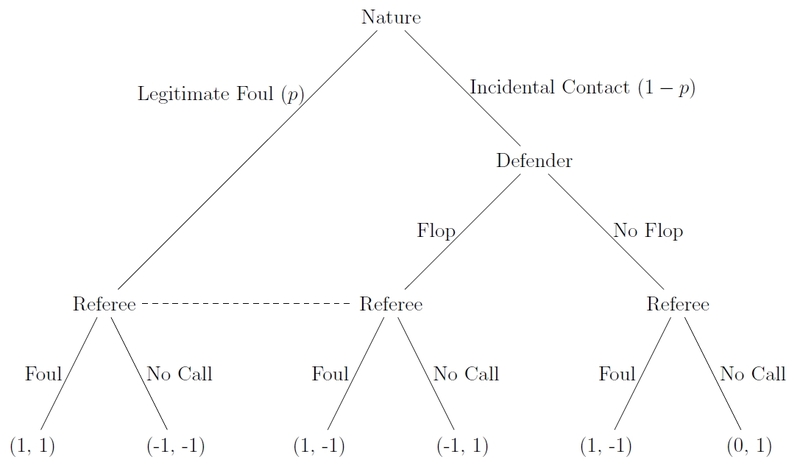 The player receives 1 if the referee calls a foul, 0 if he does not flop and the referee does not call a foul, and -1 if he flops and the referee does not call a foul. Put differently, the defender’s best outcome is what minimizes the offense’s chance at scoring while his worst outcome is what maximizes the offense’s chance. Flopping does not work, since the referee knows no foul took place. This is why players don’t randomly fall to the ground when the nearest opponent is ten feet away from them. Note the the referee will call a foul if he believes that the probability the play was a foul is greater than 1/2. Thus, if the defender flops, he knows the referee will call a foul. As such, the defender always flops, and the referee calls a foul. This is intuitive: on plays that look a lot like a foul, defenders will embellish the contact regardless of how hard they are hit. First, can the defender flop as a pure strategy? If he does, the referee’s best response would be to not call a foul, as the referee believes the probability a foul occurred is less than 1/2. But given that the referee is not calling a foul, the defender should deviate to not flopping, since he will not get the call anyway. Second, can the defender not flop as a pure strategy? If he does, the referee’s best response is to call a foul if he observes the defender falling, as he knows that the play was a legitimate foul. But this means the defender would want to deviate to flopping, since he knows he will get the foul called. This exhausts the defender’s pure strategies, so the defender must be mixing in equilibrium. Third, can the referee call a foul as a pure strategy? If he does, the defender’s best response is to flop. But then the referee would not want to call a foul, since his belief that the play was actually a foul is less than 1/2. Fourth, can the referee not call a foul as a pure strategy? If he does, the defender’s best response is to not flop. But this means the referee should call a foul upon observing the defender fall, as he believes the only way this could occur is if the foul was legitimate. This exhausts the referee’s pure strategies, so the referee must mix in equilibrium. Strategically, these parameters are the most interesting. In equilibrium, the defender sometimes bluffs (by flopping) and sometimes does not. Upon observing a fall, the referee sometimes ignores what he perceives might be a flop and sometimes makes the call. The real loser is the legitimately fouled defender. He can’t do anything to keep himself from falling over, yet sometimes the referee does not make the call. Why? The referee can’t know for sure whether the foul was legitimate or not and must protect against floppers. While this seems unfortunate, be glad the referees act strategically in this way–the alternative would be that defenders would always flop regardless of how incidental the contact is and the referees would always give them the benefit of the doubt. One of game theory’s strengths is drawing connections between two different situations. Although this post centered on flopping in the NBA, note that the model was not specific to basketball. The interaction could have very well described other sports–particularly soccer. As long as fouls provide defenders with benefits, there will always be floppers waiting to exploit the referee’s information discrepancy. This entry was posted in Game Theory, Sports and tagged Game Theory, Sports. Bookmark the permalink.